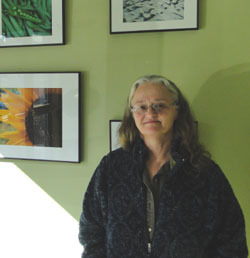 Terry Sprague of North Haven in front of her photography exhibit at NRCM’s office in Augusta. Almost since the launch of NRCM’s popular website feature, “My Maine This Week,” North Haven resident Terry Sprague has been sending along her photos. To celebrate her talent, and her love for Maine’s environment, Terry’s work is being featured in her own “My Maine This Week” slide show. We also spoke with Terry about her photography. NRCM’s Beth Dimond: Can you tell us a little about your favorite subject matter? Terry: Most of my photos are taken on North Haven. Close-up flora and fauna are favorite subjects. I love landscape shots with sharp near and far focus but find it difficult sometimes to capture the right exposure and true color with digital photography. Thank goodness digital allows many, many shots! The most rewarding thing to me about taking photos is when you see in your mind’s eye the perfect composure of subject, light, and color and find when you download, you’ve actually captured it. Beth: North Haven is a beautiful place, and you capture its beauty so well. How long have you been interested in photography? 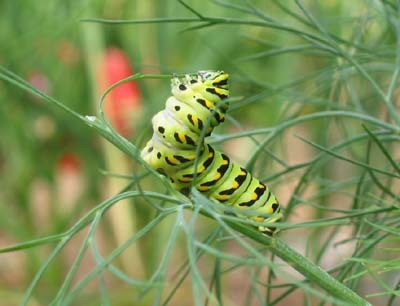 Black swallow-tailed caterpillar. This photo by Terry Sprague is part of our “My Maine This Week” traveling photography exhibit. Beth: Ah, actually, no! But I’ve seen images of them. Terry: And an inexpensive film SLR, a nice little Yashica film point-and-shoot, a step up to a Canon Rebel 2000 film SLR…then after learning how to use a computer (at age 50!) I bought a Canon Powershot30, my first digital point-and-shoot. My most used camera now is Canon’s Digital Rebel XTi SLR. Beth: What inspires you most, do you think? Terry: I think it is the natural diversity of Maine that inspires me. There’s always something new to capture if you slow down and look. Even in the small surrounds of North Haven! Beth: Where in Maine would you like to go to photograph that you have yet to visit? Terry: I haven’t been yet to most of this big beautiful state, with the exception of Baxter and Acadia and points Down East. Maybe Grafton Notch and the lakes and mountains in western Maine. Beth: That is a beautiful area! We look forward to one day seeing your photos from the region, and meanwhile, enjoying others that you send us. Thank you for taking the time to answer our questions, Terry.